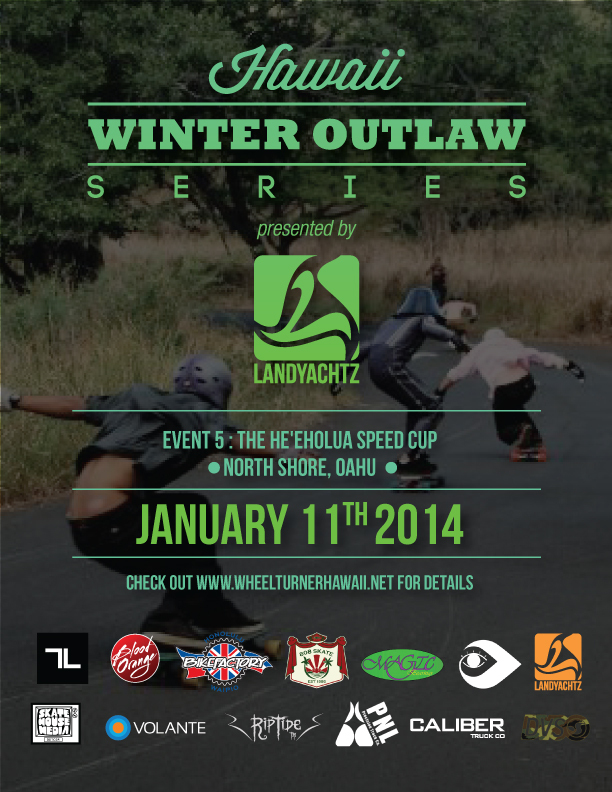 HawaiiWinterOutlawSeries Event 5- The He'eholua Splash Cup. Write Up & Photos. WheelTurners woke up early, checked to see if the rain from the night before was lingering... and once they saw sun they rushed to make the journey to the North Shore for event 5 of the Hawaii Winter Outlaw Series. When everyone showed up, we got geared up and started the skate in on the closed road towards the hill. Upon arrival we saw that some of the shadows were still a little patchy from the rain the night before. But with sign ups and bracket making it gave it some time to start drying. No one wanted to race this course in the wet thats for sure. 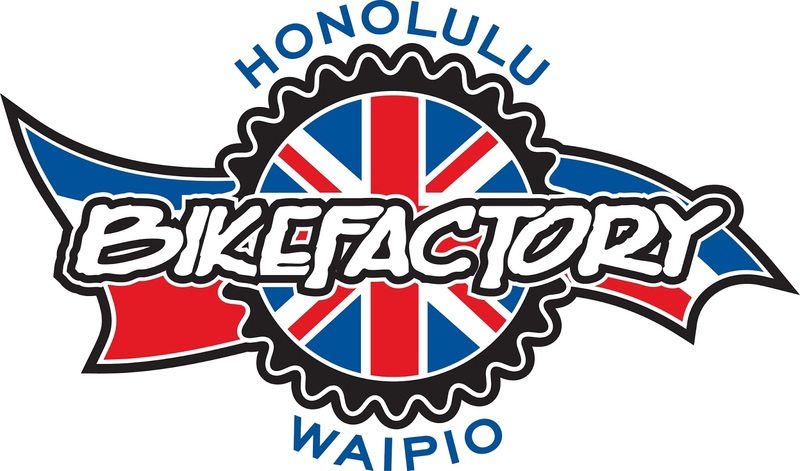 The He'eholua course is just under a mile along with several big sweepers topping you out at just under 50mph, and its the most slick road I've ever rode in the rain... so riders chose to give it a little extra time to ensure that it was dry. 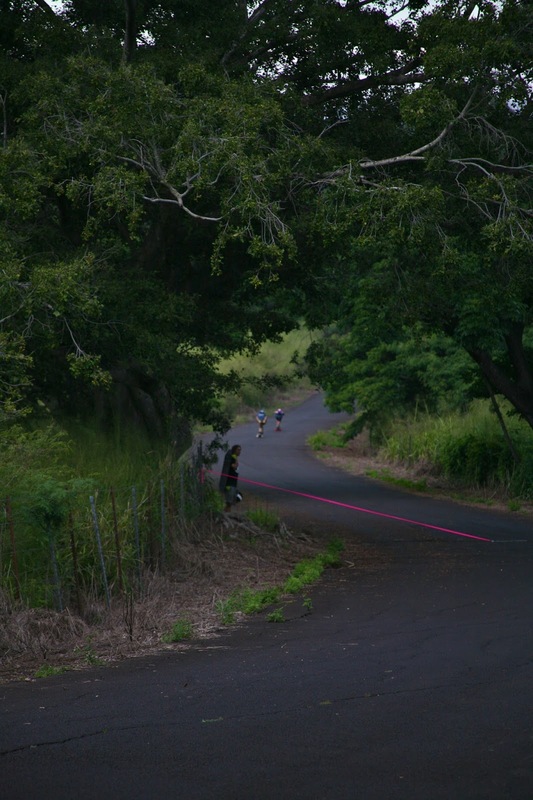 Once the road was ridable, the course was set up and riders went for their practice run. Some came back up STOKED, others terrified. All riders were now at the start line, waiting in their heats and BOOM. Rain. What the heck! Sunny to cloudy in minutes... the perks of living in Hawaii. So we took some time to try figuring out what everyone wanted to do now... Race another course or wait out the rain. The decision was made to meet up again at 4pm and hope for no rain. We all headed back down the hill and into Haleiwa town for lunch and to chill for a bit then we headed back to the hill. When getting back to the course we were stoked to see dry roads... so we rushed in to get things started as quick as possible.With the change in the schedule we lost several racers, so we cut the entry fee in half and still went for the heats. First round was already the quarter finals. Everyone was getting a little antsy to race already, so we got in place for the heats to start as quick as possible. Round one is on the line. As soon as the first heat begins to kick into the hill, the rain starts to come again. I expected to get the call on the walkie talkies that the rest of the heats were off... but instead they started sending the heats down even quicker! This round was hectic! The road got instantly slick taking out several riders within their first heat. TOO NUTS. Once all the heats were complete we headed back up the hill to check on all the riders and to see what was going to happen next. As we were hanging out talking about what to do, the rain stopped again for a little bit. All the riders who made it down the hill successfully in the first round ran back up the hill and decided to make this round an automatic final. 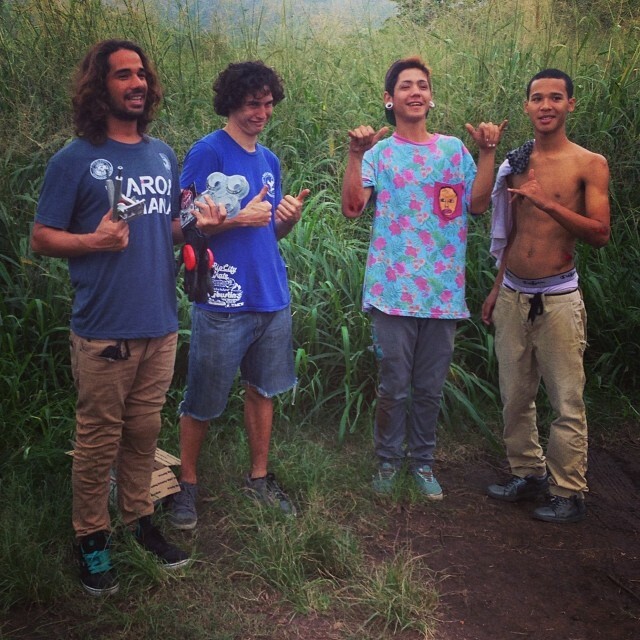 It was KJ Nakanelua, Kaimana Pinto, Dante Alston and Kona Cleaver-Purdy. 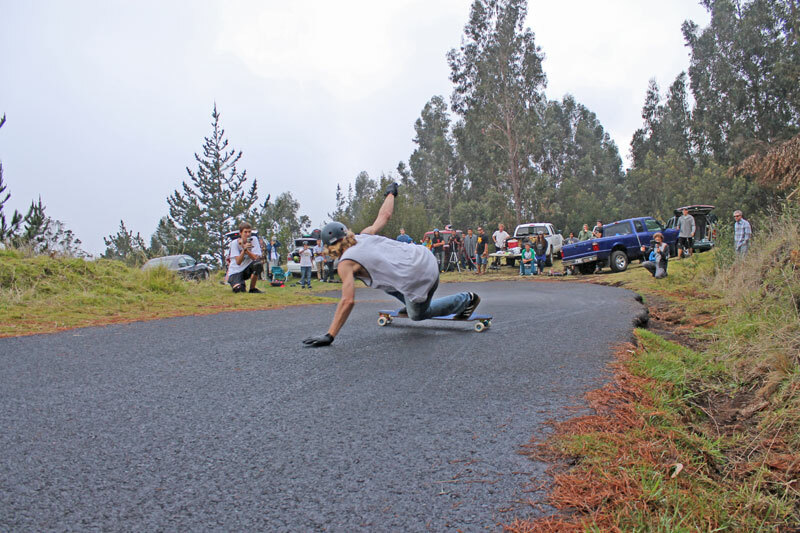 The finals were on and they all kicked into the hill with no fear, riding in a tight pack. 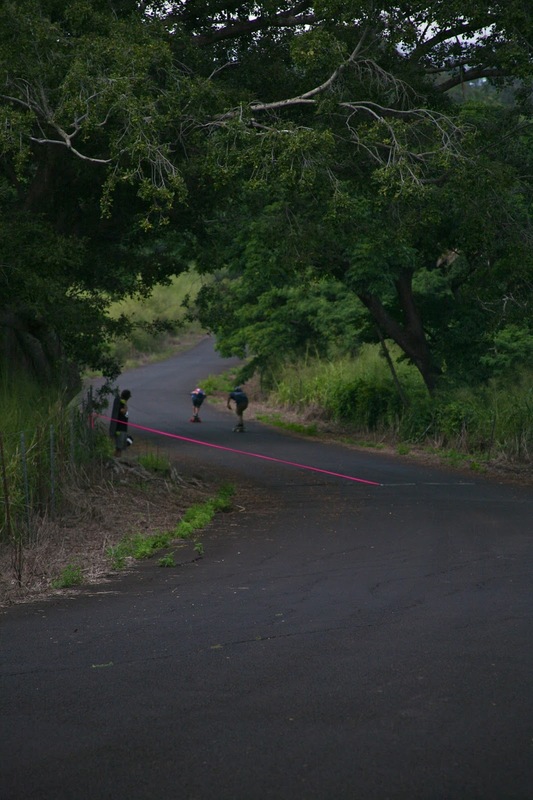 As they start to approach the infamous Death Crack at the fastest part of the hill, Dante and Kona start to go wide to work their war around KJ and Kaimana. BAM!!! As the move is being made Dantes board decided to squiggle in the wet, ejecting him off his board in front of Kona... Kona also goes down avoiding the fall. From there on it was Kaimana chasing KJ who was in full tuck from start to finish. KJ takes the win! Proving once again to not be afraid of any conditions. Following the finals we headed down the hill for the awards and to patch up all the cuts. 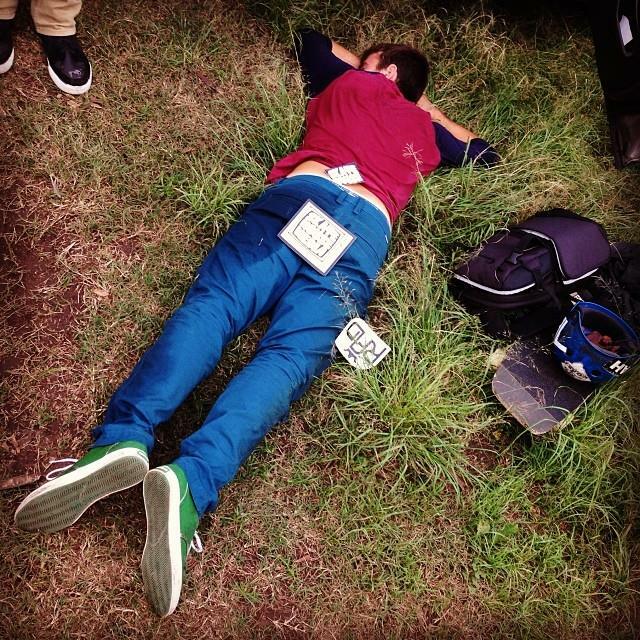 Every rider who skated the event was STOKED to go home with a prize thanks to our sponsors. First place also taking home a bit of cash with the schwag! 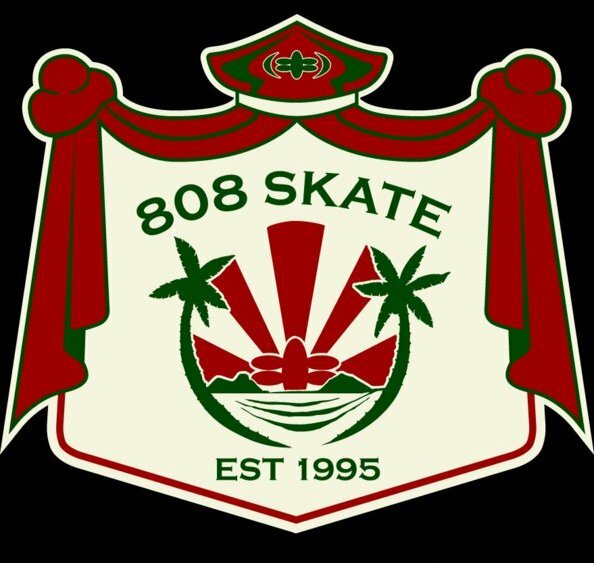 Mahalo's everyone for coming out and surviving the gnar, get hyped for the 6th and final HWOS event coming up in Feb... FOSAL 6! Mahalos to all of the supporters who could make this event possible. The Festival of Sugar and Love 6! 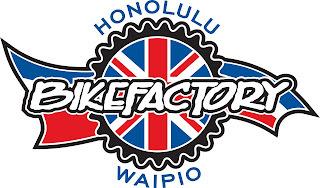 HawaiiWinterOutlawSeries Event 4- The Maui Challenge 4. Write Up, Photos and Video. Write Up by WheelTurnerHawaii Ambassador Kaimana Pinto. There was no shortage of action on Maui this year around the time of the 4th annual Maui Challenge. 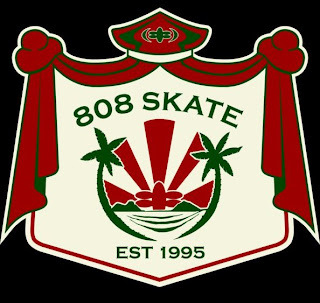 This year 3 cars full of the homies from Oahu, 1 van squeezing 8 big island boys, and a few randoms were lurking the zones and feeling the vibes all over the island. Surf was pumping all week, sun was shining, and sessions were going off. The event started at 11 am as a no-entry-fee jam style contest with our boy Kili Brown from KAVA ROOTS inc. to judge alongside event organizers Brody Sanitago and Kaimana Pinto. Prizes were to be awarded to top 4 over-all styolists, and enough knick-knacks, stickers, and shirts to pass out to every grom. There were also 5 sub-categories, one of which was a CREW SHOWDOWN where you would take a run with your crew and were scored collectively on flow, how tight they were, and how clean the lines were. The categories prized a set of Divine wheels as well as a Paris skate tool, as well as a board from Landyatchz Longboards. The Crew showdown was awarded with a new wardrobe courtesy of 50th State of Mind. The boys were givin’ um for the jam, we seen it all from patchy 540 slides (on RAD Advantages, btw) to airs OVER the inside of the corner to switch speed runs. It was a super difficult event to judge, but we decided on the results as followed. Matt was stoked to walk away with his first place package from Kava Roots as well as a few racks of coconuts courtesy of Kaimana, Kj, and Dusty. 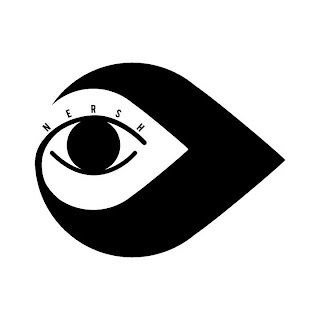 The rest of the Podium received gear from Landyachtz, Blackdog Longboards, Bear trucks, Caliber trucks, Paris Trucks, Divine Wheels, Nersh wheels, Hawgs wheels, and 50th State of Mind Clothing. 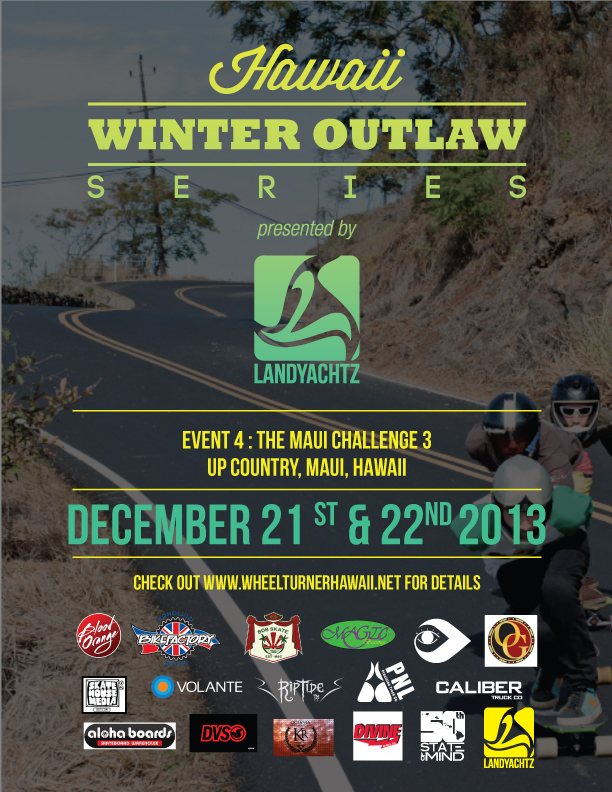 HawaiiWinterOutlawSeries Event 5. 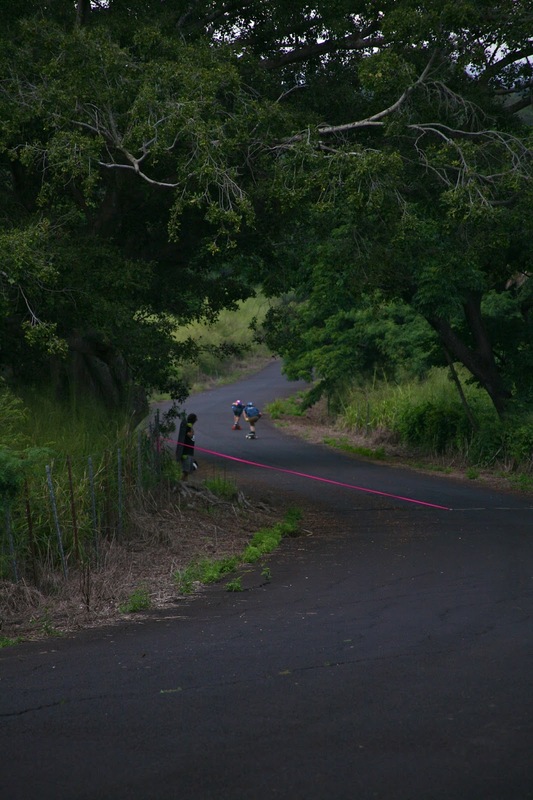 Landyachtz presents The He'eholua Speed Cup. It's a new year, and January marks the 5th event of the Hawaii Winter Outlaw Series... time sure is flying. 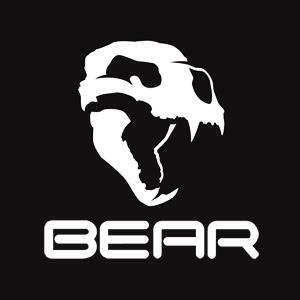 So far this years series has been nothing but successful once again! 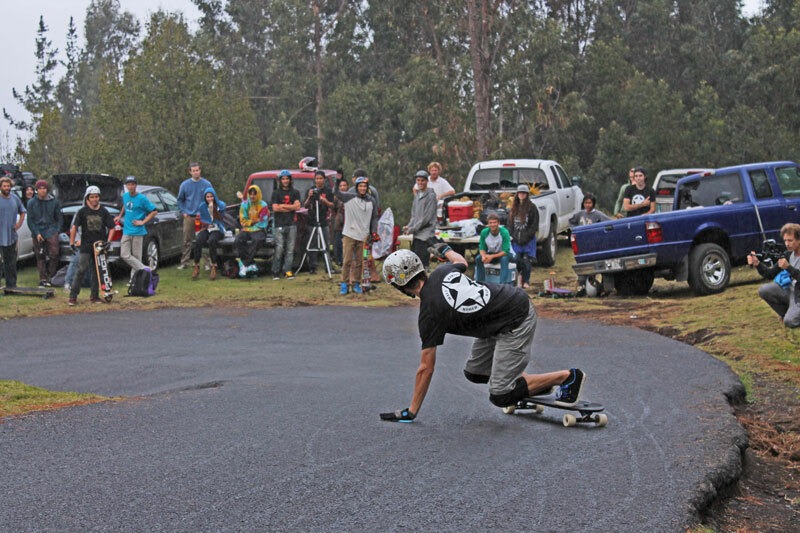 The Papaholua Speed Cup will be on Oahu, Jan 11. and is gonna be one to remember. Like the ancient people of our Aina used to do, we will be flowing the hills at high speeds (40mph ish) to pay respect to the mountain. Unlike the last couple of years, this will not be a boarder cross type event... but more of a full tuck kinda deal. So bring the gear needed to do so. It will be $20 to Jam. All cash will go into refreshments and to some of the top Jammers. Like all H.W.O.S events, Leathers are recommended... Fullface Helmets and Gloves are REQUIRED. To keep things quick, safe and efficient we will be capping this event at 32 riders. If you'd like to come jam just send over an email with your Name, Age and Phone # to StokedSkaters@aol.com. When you send your email you will get a confirmation email with all the details on time, location, ect. Hope to see everyone on the 11th, be sure to get them emails in!